NEW YORK--(BUSINESS WIRE)--Barbara Corcoran, nine-season Shark on ABC’s “Shark Tank,” real estate mogul, author and investor; and iHeartMedia, the leading media company in America with a greater reach in the U.S. than any other media outlet, announced today the launch of a new original podcast, Business Unusual With Barbara Corcoran on iHeartRadio, the free all-in-one digital music, podcast, on demand and live streaming radio service. Corcoran and iHeartMedia will co-produce Business Unusual with Barbara Corcoran, which will draw on Corcoran’s 30+ years of business expertise, life lessons and Shark Tank anecdotes. Each episode of the weekly podcast is created with busy, on-the-go listeners in mind featuring Corcoran’s expert advice packed into snackable, 5-minute long episodes. iHeartRadio will promote the podcast by airing audio vignettes from the show across iHeartMedia’s broadcast radio stations, exposing the content to more than a quarter of a billion monthly listeners across the country, as well as on iHeartRadio. In 1973, Corcoran founded The Corcoran Group – the residential real estate brokerage she built from scratch. Operating from her gut and brilliantly marketing her apartments is what made Corcoran a huge success. Twenty years later, she sold The Corcoran Group for $66MM. Today, Barbara is an author, motivational speaker, and reality TV star on ABC’s three-time Emmy award winning show Shark Tank. Nine seasons later, Corcoran is one of the show’s most beloved Sharks – an experience she chronicled in her best-selling book Shark Tales: How I Turned $1000 Into a Billion Dollar Business. This book was the inspiration for what is now Business Unusual. iHeartRadio, iHeartMedia’s free all-in-one digital music, podcasting, on demand and live streaming radio service, is dedicated to providing an all-in-one listening experience that helps users discover new podcasts alongside their favorite live radio stations, personalities and on-demand music. With iHeartRadio, listeners can enjoy their music and podcasts across more than 250 device platforms including in-car, in-home, on wearables, across gaming consoles and more – making their favorite audio content available everywhere they are, on the devices they use most. Visit iHeart.com/apps to download and listen to Business Unusual with Barbara Corcoran on your favorite device now. 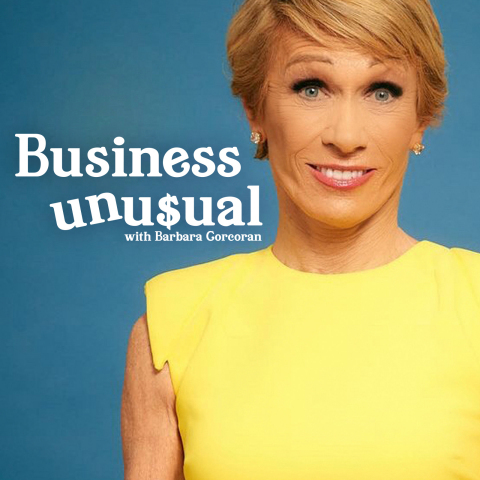 Proud sponsors of the Business Unusual with Barbara Corcoran podcast include Indeed and Dell Small Business. With over a quarter of a billion monthly listeners in the U.S. and over 129 million social followers, iHeartMedia has the largest national reach of any radio or television outlet in America. As the leading media company in the U.S., iHeartMedia serves over 150 local markets through 849 owned radio stations, and the company’s radio stations and content can be heard on AM/FM, on satellite, at iHeartRadio.com, on the company’s station websites and on iHeartRadio, iHeartMedia’s digital music, podcast, on demand and live streaming radio service, available on over 250 platforms and 2,000 devices, including on digital auto dashes, tablets, wearables and smartphones, on virtual assistants, smart speakers, TVs and gaming consoles. iHeartMedia’s platforms include radio broadcasting, online, mobile, digital, social, podcasts, personalities and influencers, live concerts and events, syndication, music research services and independent media representation. iHeartMedia is a division of iHeartMedia, Inc. (PINK:IHRTQ). Visit iHeartMedia.com for more company information.